This article discusses some of the key issues that investors should be focused on for investing in BDCs. There continues to be a gap between valuations with many currently trading at a 20% or more discount to book value. Investors should take advantage of the current BDC pricing but use discretion with upcoming purchases. As BDC prices continue to reach new lows for the year, I would urge investors to exercise discretion. I believe 2014 was a wakeup call, especially for externally managed BDCs that are now trading well below net asset value ("NAV") per share. As mentioned in previous articles, this has been a tough year due to being removed from the S&P and Russell indices, continued interest rate fears, general declines in small caps, selling institutional shareholders over the last two quarters and December tax-loss sellers. The valuation gap between BDCs is growing and I believe it is important for investors to identify the key differentiators that will drive opportunities and risks in the coming quarters. "Assets whose fair value cannot be determined by using observable measures, such as market prices or models. Level 3 assets are typically very illiquid, and fair values can only be calculated using estimates or risk-adjusted value ranges." 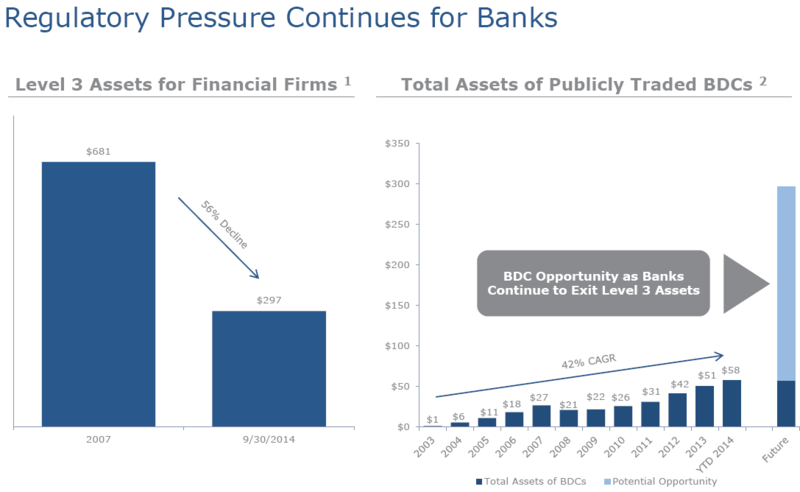 However these assets are a growing opportunity for BDCs as bank regulations have increased. The following chart was provided by Medley Capital (NYSE:MCC) in the most recent presentation. General market trends: competition, credit spreads, regulations, etc. Seeking Alpha is known for using crowd sourced content to predict stock returns as discussed in a WSJ article earlier this year. I have organized a survey for readers to weigh in on what they believe to be the most important issues for BDCs in the coming quarters that will drive potential risks and opportunities. The results of the survey are displayed in real time after each response, so please visit the following link to participate. The articles in this series will only cover these issues at a high level with general descriptions and some links to relevant articles. Many of my articles focus on the ability of BDCs to cover dividend payments with income and gains from the portfolio. This is directly tied to shareholder value in many ways including regular dividend sustainability, the potential for special dividends, NAV per share declines or stability, the need to reach for yield and risk profile, pricing multiples paid by investors and overall returns to shareholders. Over the last four quarters six BDCs have cut their dividends: BlackRock Kelso Capital (NASDAQ:BKCC), Fifth Street Finance (FSC), Full Circle Capital (FULL), KCAP Financial (KCAP), MCG Capital (NASDAQ:MCGC) and Prospect Capital (NASDAQ:PSEC). Many BDCs are relatively new and have not been through a major recession and some economists believe we are near the top of a credit cycle and have been approaching it with a frothy lending environment of higher debt-to-EBITDA multiples and 'covenant lite' loans. BDCs that have grown the portfolio more than most over the last six to eight quarters could be the most at risk from a vintage standpoint. However it is important to consider the asset class and yield of the new loans. Some of the newer and smaller BDCs are actively growing the portfolio but with safer asset classes and lower yields such as TCP Capital (NASDAQ:TCPC), TPG Specialty Lending (NYSE:TSLX), PennantPark Floating Rate Capital (NASDAQ:PFLT) and Golub Capital BDC (NASDAQ:GBDC). Recently I have been focused on BDC management expenses because it is a primary driver of value to shareholders. Management is responsible for investing capital at appropriate risk adjusted yields, using proper capitalization and dividend policies to control the cost of capital while maintaining an efficient operational cost structure to deliver dividends to shareholders. These dividends need to be sustainable and at a yield that rewards investors for the amount of risk associated with the portfolio. BDCs with lower fees and/or that are more efficient will deserve a premium paid by investors. My latest article that discussed expenses, "BDC Expense Ratios for Q3 2014", did not take into account the recently reported results for FSC, GBDC and MCC that I have included in the following table as well as TriplePoint Venture Growth (NYSE:TPVG) that I am considering adding to my BDC coverage. 'Available income' is total interest and fee income less interest expense from borrowings and is the amount of income that is available to pay management expenses and shareholder dividends. BDCs with lower expenses can pay higher amounts to shareholders without investing in riskier assets. I believe the dividend cuts for FULL, FSC and PSEC were in part due to having higher operational expenses. Internally managed BDCs such as KCAP, Main Street Capital (NYSE:MAIN), Hercules Technology Growth Capital (NYSE:HTGC) and Triangle Capital (NYSE:TCAP-OLD) have much lower operating cost structures that usually results in a higher multiple of NAV per share especially for MAIN and HTGC. I will cover the following issues at a high level in the remaining articles for this series: potential equity issuances, impacts from rising interest rates, total return potential, pricing and valuations, inside and institutional ownership levels, general market trends: competition, credit spreads, regulations, etc. and potential oil/energy related issues. For more information about potential impacts from an economic downturn, dividend coverage and operational expenses please see my "BDC Research Page" and for information on specific BDCs please visit my "Index to BDC Articles".